A Practical Framework Approach to Change - A FREE presentation outlining my own tested approach to managing change. A FREE presentation outlining my own tested approach to managing change. Download the A Practical Framework Approach to Change by submitting the blue form below. Over the last 25-years or so, I have developed and implemented many bespoke Business Change and Transformation approaches and strategies for organisations to enable them to drive through change initiatives/programmes and achieve considerable ROI and business benefit. 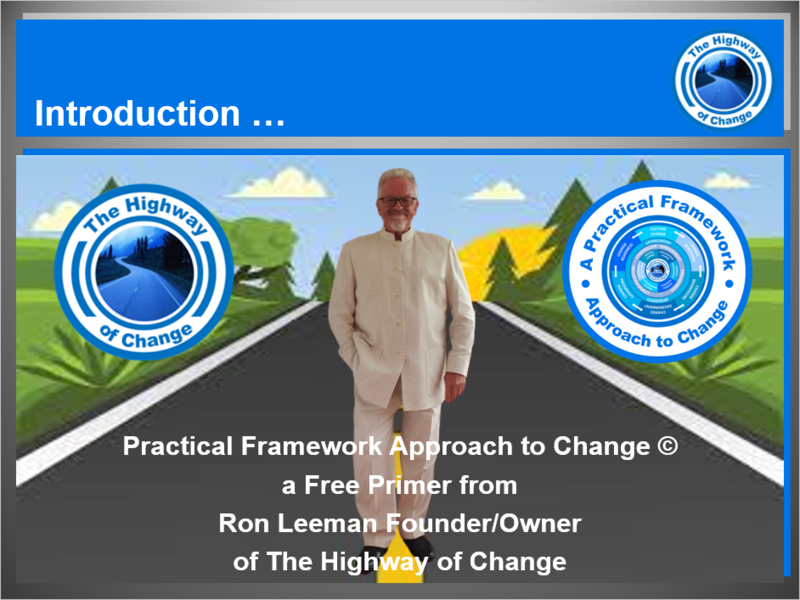 These bespoke approaches have used as their basis my Practical Framework Approach to Change, which is described at a high-level in this PowerPoint presentation. These are designed to give you a flavour of some of the more necessary change components and associated tools & techniques that will require consideration during any change initiative. Ron Leeman has been Change, Process and Project professional since 1974. In 2012, he was recognized as a Change Leader by the World HRD Congress. Download the A Practical Framework Approach to Change now!